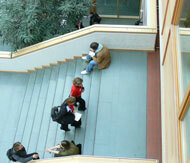 Among foreign students, those from Polish Lithuania were in first place, with a total of 1348 immatriculated students. The seventeenth century saw the highest number of Polish students, namely 456. And at the Faculty of Theology, students coming from the East were in the majority. The matriculation rolls of the old Viadrina include the well-known names of Ulrich von Hutten, the composer Carl Philipp Emanuel Bach, the theologian Thomas Müntzer, the poet and dramatist Heinrich von Kleist, a native son of Frankfurt (Oder), and the brothers Alexander and Wilhelm von Humboldt. First rector of the old Viadrina at its founding was Conrad Wimpina, holding Ph.d. in theology, previously rector of the University of Leipzig. Frankfurt (Oder) was the backbone as well as a center of focus and influence for a variety of forms and manifestations of the entire Age of Enlightenment in all its stages. In its heyday, Viadrina represented a seat of humanism and enlightenment, an avantgarde university located at the outermost border to the East, an eastern outpost of progressive teachings. After the Prussian state had opened its own major university in Berlin in the year 1810, which bears the name of the Humboldt brothers today, the old Viadrina was obliged to close its doors the following year, after more than three hundred years of pioneering scholarship and education at the intersection of Western and Eastern Europe. Some professors of Viadrina later taught at the university in Berlin. Most of the library and some of the faculty moved to the Silesian capital of Breslau (today Wroclaw), where they formed the nucleus of what, together with the existing Leopoldina College, then became the University of Breslau. 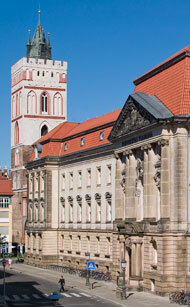 Of the old university building, only the portal remains, which is now part of the Viadrina Museum. In the archives of Frankfurt (Oder) are to be found a number of historical documents pertaining to the original university on the Oder.